Strange - no, bizarre things are happening in Odyssey. And it all seems to be connected to one place - Novacom Broadcasting. The mysterious company is involved in all kinds of questionable schemes. And now the townspeople - maybe the whole world - are in danger. Whit's starting to figure things out, but will it be too little too late? Find out as the Novacom saga races to a startling conclusion! Strangeno, make that bizarre things are happening to your favorite Odyssey characters. 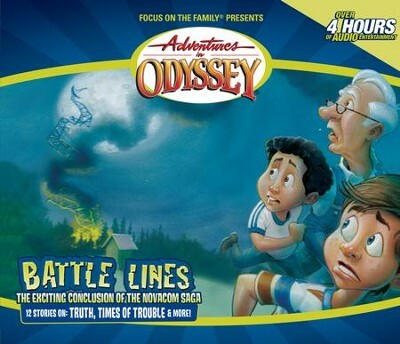 Jason in Alaska and Whit in Odyssey both encounter miraculous healings and unexplainable violence. Before you know it, this strange phenomenon has affected nearly everyone in Odyssey, while a trail of shady characters appears, then disappears only to turn up again someplace else. Whit's starting to put things together all right, but will it be too litlle too late? Shocking developments are coming to light . . . even Whit himself is being used as part of this sinister plan. Is Whit all out of options? Find out as the Novacom saga races to a startling conclusion! I'm the author/artist and I want to review Adventures in Odyssey ® #38: Battle Lines.